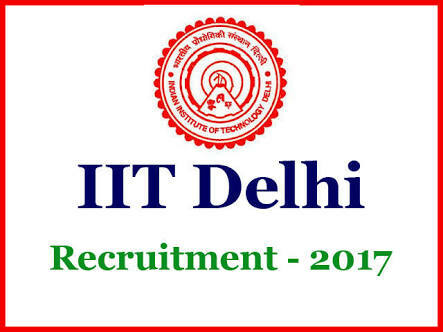 Indian Institute of Technology (IIT), Delhi Recruitment 2017 | 54 Junior Engineer, Technical Superintendent & Other Posts: Indian Institute of Technology (IIT), Delhi has published Recruitment notification for filling up 54 posts of Junior Engineer, Junior Technical Superintendent, Junior Superintendent, Junior Accounts Officer, Junior Superintendent, Senior Mechanic/ Sr. Laboratory Assistant, Assistant Mess Manager & other posts. More information please read below mention officially notifications carefully. Application Fee: Rs. 50/- for OBC category. No fee for SC/ST & PwD category. How to apply : Apply online through the website http://www.iitd.ac.in from 25/11/2017 to 11/12/2017. Starting Date of Online Application :25/11/2017. Last Date of Online Application : 11/12/2017. Last Date for Submission of Hard Copy of Application: 21/12/2017.